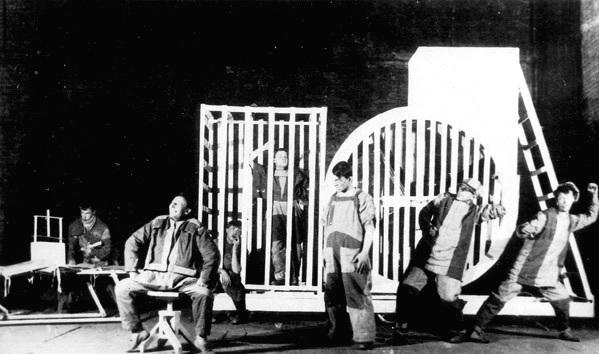 In 1922, Meyerhold staged his first Constructivist performance. This was of The Magnanimous Cuckold by the Belgian playwright Fernand Crommelynk. 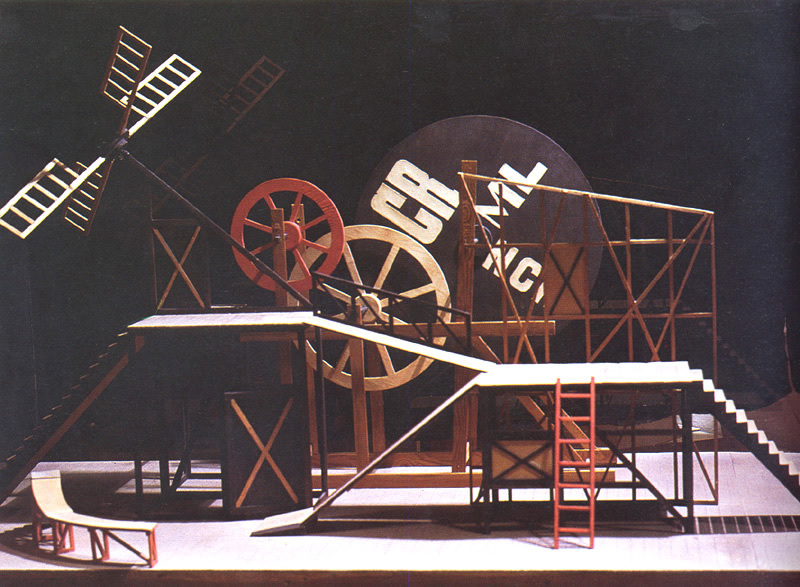 Popova's three-dimensional, bare-wood set stood alone on an otherwise bare stage. Note the windmill blades in the upper right of the construction, which were meant to remind the audience of the play's Flemish origins. The actors in this photograph are carefully placed, and they worked together in a remarkably rhythmic production. For video clips of actors rehearsing Meyerhold's biomechanical exercises, click here. You will need the QuickTime Movie player. 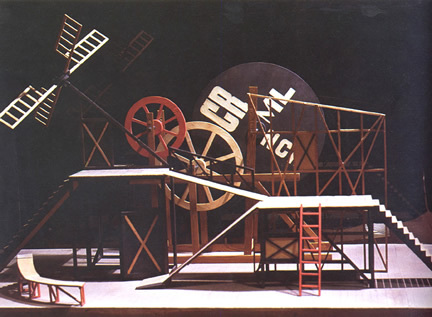 The photograph to the right shows Liubov Popova's maquette for the construction used in Meyerhold╧s 1922 production of "The Magnanimous Cuckold". 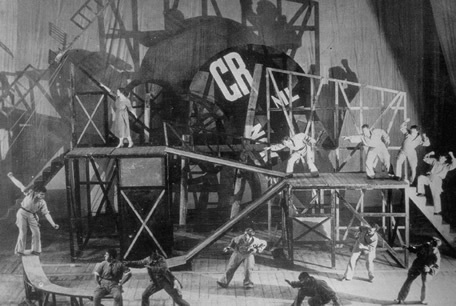 For Meyerhold's 1922 production of "The Death of Tarelkin", he engaged the constructivist artist and designer Varvara Stepanova. As opposed to the single machine that had dominated the stage in Popova's design for "The Magnificent Cuckold," Stepanova created a series of discrete "apparatuses" that could be combined to make larger constructions or used separately. The apparatuses could be and were manipulated in a variety of ways by Meyerhold's skilled actors. The production as a whole fit in well with Meyerhold's desire at this time to bring circus and acrobatic element into the serious theater.